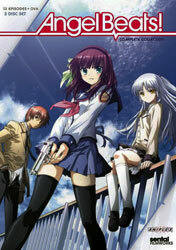 The Anime Archivist: Video Backlog: "Angel Beats!" Even though I have been watching anime for well over 15 years now, I’m only just beginning to recognise some of the familiar (and overused) plot and setting patterns used in many anime. One that has just been brought to my attention is that supposedly the Japanese consider high school to be the best part of life. From where I sit it seems rather an oppressive environment with a culture that forces children to conform rather than to develop any sense of individuality, even more so than western schools. And with teenagers being teenagers, bullying and pecking orders develop. I really can’t see why Japanese otaku want to see this over and over again as their kind is not well liked in that environment. Maybe they want to relive it with better memories of it or where characters they can relate to are the winners as such. Anyway this show is yet another based in a high school with a focus on the students. I was also dreading watching it because the story and character designs were from Key/Visual Art’s with the guy who wrote the scenarios for the evil three, “Kanon”, “Air”, and “Clannad”, also writing this one. However what is different with this show is that unlike those three and almost every other high school drama or comedy, the core plot really sets it apart. Dead teenagers mysteriously end up at some sort of high school where they wait to be “obliterated” and sent to the next world by a strange girl dubbed “Angel” who is also the president of the student council. While most of the students are quite passive and are in fact not actually humans who have passed over but are seemingly there to make the place “comfortable” (non-player characters or NPCs as the Battlefront calls them), a few have decided to rail against the order of this world. The Battlefront, headed by Yuri Nakamura are out to destroy Angel (or at least disrupt her activities) and to fight against God, whom they assume is behind all of this. While I found some of the elements initially annoying, such as the rather unfunny humour and the characters really seemed to be caricatures, it really won me over. The animation, which I thought was Kyoto Animation, is actually by P.A. Works (“True Tears”, “Canaan”, “Professor Layton and the Eternal Diva”) who certainly gives them a run for their money. Rather than the run of the mill Key show, there is a lot more action here with the Battlefront confronting the seemingly cyborg-like Angel with a cache of weapons created by an underground (literally) secondary group. There’s also a female rock band called Girls Dead Monster whom the Battlefront use to distract Angel, mostly so they can steal meal vouchers so they can eat (there’s a certain lack of logic to this as none of the other students need to do this, plus they seemingly always have money to buy drinks out of vending machines). Both elements are damn fun and are used to great effect. But taking away the glossy and fantastic looking animation, girl rock band and gun fights, a great story is being told here. Though like a lot of modern anime, it doesn’t truly start until the half way mark where the newest member of the Battlefront, Yuzuru Otonashi (whom the show focuses on mostly), realises what this world is all about and how to help people in the world complete what they are meant to do in this world and move on. Also like a number of modern anime, little hints are dropped along the way which leads to this revelation. While there were some really schmaltzy and emotionally manipulative scenes, especially towards the back end of the show and in regards to the backstories of the characters, I mostly forgave a lot of this. At least in this show the audience is not treated like they were dullards and subtlety didn’t take a back seat like it did in Key’s “Kanon”, “Air”, and “Clannad”. While most wouldn’t agree with me, I find this show to be overwhelmingly better plotted and written and the dialogue is natural not infantile like those other three shows. Summing up, this is a very surprising show with a very unusual idea for anime of this nature. There are some lapses in logic, but I could easily suspend disbelief for the greater majority of the show. Not the best thing ever made, that’s for sure, but it is exceptionally well made and really solid entertainment. 7.5 out of 10. Video Backlog: "Space Battleship Yamato"
Video Backlog: "Kashimashi: Girl Meets Girl"
Video Backlog: "First Squad: The Moment of Truth"
Video Backlog: "Allison & Lillia"